The articles published in Journal of Fertilization: In Vitro - IVF-Worldwide, Reproductive Medicine, Genetics & Stem Cell Biol have been cited 39 times by eminent researchers all around the world. 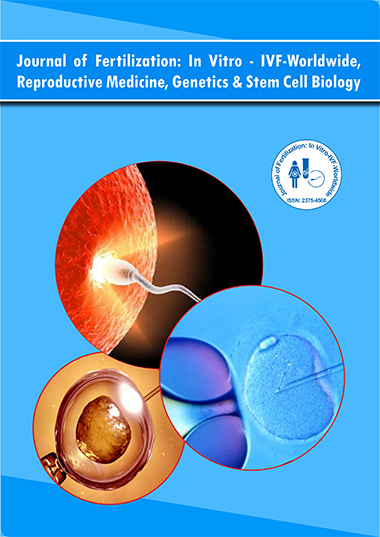 Following is the list of articles that have cited the articles published in Journal of Fertilization: In Vitro - IVF-Worldwide, Reproductive Medicine, Genetics & Stem Cell Biol. Domnina AP, Novikova PV, Lyublinskaya OG, Zenin VV, Fridlyanskaya II et al. (2016) Mesenchymal stem cells with irreversibly arrested proliferation stimulate decidua development in rats. Experimental and Therapeutic Medicine 12; 2447-2454. Hunter II RK, Nevitt CD, Gaskins JT, Keller BB, Bohler Jr et al. (2015). Adipose-Derived Stromal Vascular Fraction Cell Effects on a Rodent Model of Thin Endometrium. PloS one 10; e0144823. Zhao J, Zhang Q. Wang Y, Li Y (2015) Uterine infusion with bone marrow mesenchymal stem cells improves endometrium thickness in a rat model of thin endometrium. Reproductive Sciences 22; 181-188. Zhao J, Tian T, Zhang Q, Wang Y, Li Y (2013) Use of granulocyte colony-stimulating factor for the treatment of thin endometrium in experimental rats. PloS one 8; e82375. Jing Z, Qiong Z, Yonggang W, Yanping L (2014) Rat bone marrow mesenchymal stem cells improve regeneration of thin endometrium in rat. Fertility and sterility 101; 587-594. Malecki M, Malecki B (2012) Nuclear routing networks span between nuclear pore complexes and genomic DNA to guide nucleoplasmic trafficking of biomolecules. Journal of fertilization in vitro 2. Malecki M, Dahlke J, Haig M, Wohlwend L, Malecki R (2013) Eradication of Human Ovarian Cancer Cells by Transgenic Expression of Recombinant DNASE1, DNASE1L3, DNASE2, and DFFB Controlled by EGFR Promoter: Novel Strategy for Targeted Therapy of Cancer. Journal of genetic syndrome & gene therapy 4; 152. Stake MS, Bann DV, Kaddis RJ, Parent LJ (2013) Nuclear trafficking of retroviral RNAs and Gag proteins during late steps of replication. Viruses, 5; 2767-2795. BeyazÄ±t F, BalcÄ± O, Adam M, Ä°nal H, BardakcÄ± Y et al. (2016). Serum Ischemia Modified Albumin Levels in Infertile Couples Underwent in Vitro Fertilization. Gynecology Obstetrics & Reproductive Medicine 21. Grzegorczyk-Martin V, Mayenga JM, Kulski O, Belaid Y, Grefenstette I et al. (2012) Préparation endométriale chez les receveuses dans un programme de don d’ovocytes. Gynécologie Obstétrique & Fertilité 40; 507-510. Davar R, Firouzabadi RD, Ara KC (2013) Dilatation and curettage effect on the endometrial thickness. Iranian Red Crescent Medical Journal 15; 350. Bilgisine GK, Kadar CT. Üreme T Der Ko gres. Fortunato A, Boni R, Leo R, Nacchia G, Liguori F (2016) Vacuoles in sperm head are not associated with head morphology, DNA damage and reproductive success. Reproductive biomedicine online 32; 154-161. MONTE G, Piva I, Graziano A, Engl B, Marci R (2016) Ulipristal acetate prior to in vitro fertilization in a female patient affected by uterine fibroids: A case report. Eur Rev Med Pharmacol Sci 20; 202-207. Gurusamy KS, Vaughan J, Fraser IS, Best LM, Richards T (2016) Medical Therapies for Uterine FibroidsâA Systematic Review and Network Meta-Analysis of Randomised Controlled Trials. PloS one, 11; e0149631. å¼ä¸æ, æ¢åä¸°, ææ æ¶, çç»´å, å­ç­±æ¾ (2015) ææ°§ååå¯¹å°é¼ åµæ¯ç»èèåå»¶ç¼ä½ç¨çç ç©¶. çæ®ä¸é¿å­ 35; 289-295. Economou K, Christopikou D, Tsorva E, Handyside A, Cazlaris H et al (2012) Live birth after polar body biopsy and preimplantation genetic screening of aneuploidy by DNA-microarray comparative genomic hybridisation. HJOG 11. Qi S, Haddad G, Witz C, Wang W (2015) Efficiency of Polar Body Biopsy on Aneuploidy Screening by DNA Microarray for Single Euploid Embryo Transfer. In Screening the Single Euploid Embryo 123-131. Johnson MH (2011) A critical discussion of current preimplantation genetic screening strategies for improving assisted reproduction. Fishel S, Baker D, Elson J, Ragunath M, Atkinson G (2016) Precision medicine in assisted conception: A multicenter observational treatment cohort study of the annexin A5 M2 haplotype as a biomarker for antithrombotic treatment to improve pregnancy outcome. EBioMedicine 10; 298-304.